It’s feels amazing that we’ve got to the end of this academic year, we’ve seen friends leave and become ordained, we seen tutors following their call from God, we’ve seen new faces coming to study theology, and we’ve seen each other change and being formed. I feel like college is a bit like that scene in Jeremiah were he is watching the potter form and shape his clay, we are watching our fellow peers being transformed and worked into Christ-like shapes, never becoming the finished product though as we remember that the potter continues to dance with us on the wheel outside of college and beyond. The process of being formed makes me think of my favourite Gospel story, where Elizabeth who is pregnant with John, meets Mary who is pregnant with Jesus. I love the imagery of John leaping in the womb when his mother hears Mary’s greeting. John was fulfilling his calling already in the womb, identifying and pointing to Jesus. The meeting of John and Jesus before they were born, the way that John is the voice in the wilderness preparing the way for Jesus, the way that John baptises Jesus, suggests to me that as we strive to live Christ-like lives, we also strive to live John-like lives. 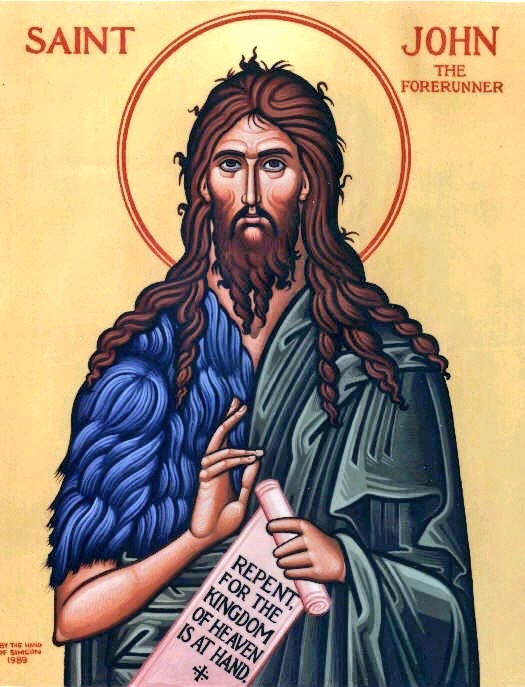 John’s vocation was to bring people back to God, for them to repent of their old ways to become open to the coming of the Lord. John proclaims Jesus the Messiah, the fulfilment of all prophecy. John did all this with no want for glory. The message he proclaimed was authentic, different to rhetoric that was being heard around, people came to listen to what he had to say and then were led to be baptised. Striving for a John-like life means that we have to become less, so Jesus can be more. It is amazing that we have finished this academic year, but we could not have done this without God’s help. We could not have written those essays, led worship, preached, prayed, listened, cared, and all the other things we do on our own without God’s strength. When we stand here feeling pleased with ourselves because of good grades, delivering a successful sermon, leading some exciting worship, connecting with the poor and destitute, we must remember it is the Spirit that guides us, that all glory is to God, the grass withers and the flowers fade, but the word of god will stand forever. When I finished my last session on my BAP, at our final worship the homily was about how we had received a lot of attention leading up to BAP, and now it was time for us to become less so He could become more. It was time to let the spirit lead and wash over, time to repent for fleshy things like ego and pride. I believe that over the summer break this teaching is important. We must become less so Jesus can become more. We must be the voice calling out in the wilderness, the prophetic call to point people to God, to direct them back into His loving arms, it is God’s grace that forgives and transforms, we walk with and point the way with encouragement and witness. We must bear witness to the truth, to stand up and question, to reach out and hold, to weep with those who are suffering and afflicted. But through all this, we must become less so Jesus can become more, we shine like the focused rays of the sun through a window, radiating the warmth and healing heat of God through ourselves. I pray that our witness and work in the spirit, our living Christ-like and John-like lives, will fulfil us with joy and keep us pointing and proclaiming the Good News of Jesus Christ to everyone we meet. Amy, i wasnt in college to hear this first hand and have only just got round to reading it now. Took my breath away as this is exactly how my time since having Leyla has felt.